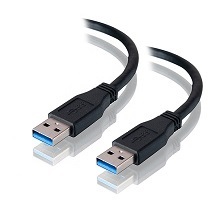 This USB 3.0 Type A to Type A Cable Male to Male is mostly used to connect two USB host devices* or for cascading between two USB devices. The cable is also backwards compatible with USB 2.0 specifications. * This is not a data transfer cable and cannot be used for data transfer between two computers.